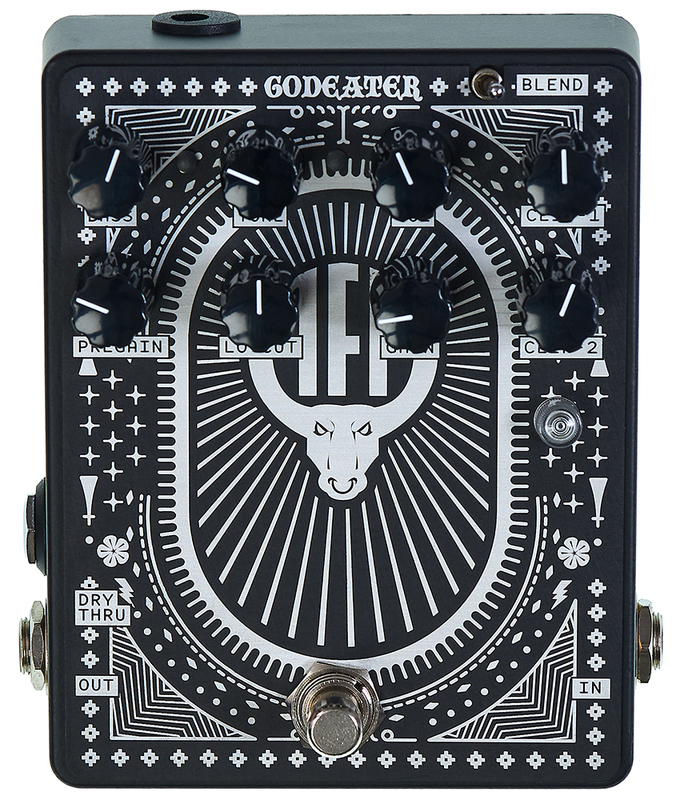 Although the Godeater was designed for bass guitar, it might just be the most versatile Animal Factory pedal yet. 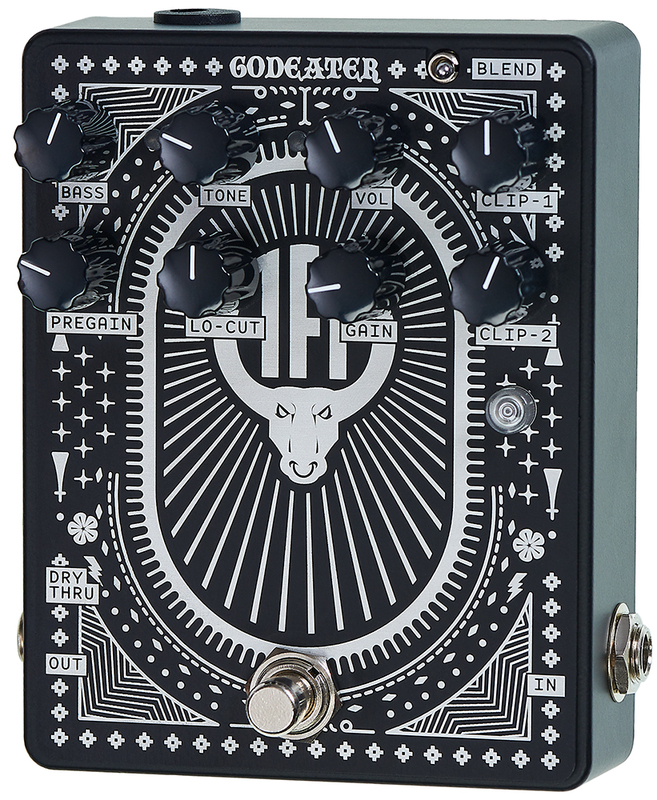 With extreme compression and saturation in the low end, this is a very unique circuit that is not a clone of any existing pedal. 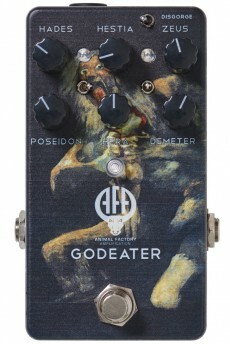 The idea behind the Godeater was to be able to run the pedal 100% distorted and have a full, strong bass response without having to dial the clean signal back in. The Godeater distinguishes between global gain and saturation with two stages of gain control. The very musical EQ can thin out the sound or go deep into the subs. From adding a subtle grunt, blending clean and dirty sounds to full doomy chords, this pedal does it all and more. The extended bass response makes it an ideal choice for downtuned or baritone guitar, but also bass synths and drum machines. 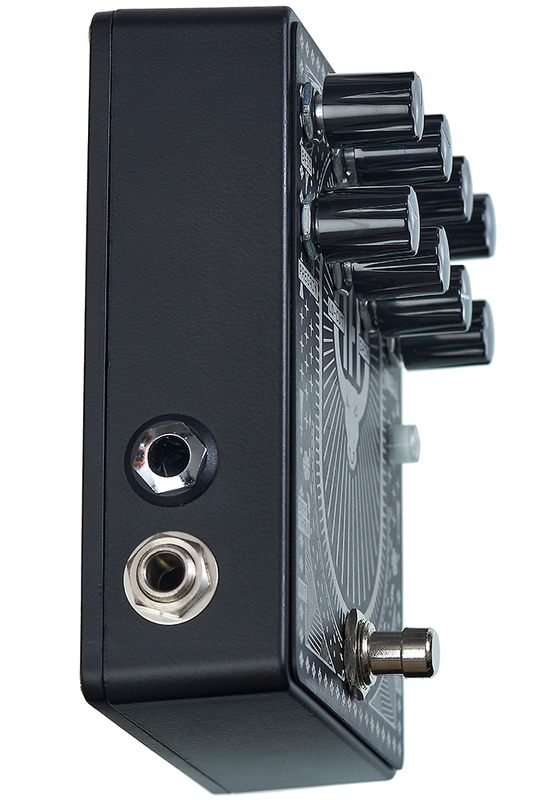 There are two switches, with three positions each, between the rows of knobs that control the kind of clipping for each clip stage. They are switched horizontally. From left to right, the switches are SYMMETRICAL DIODE - OFF - ASYMMETRICAL LED. The diode settings will significantly lower the output volume. The input stage gain control. Key to the total amount of distortion generated by this pedal. up. For fuller distortion, turn it down. Sets the gain for the saturation stages. Turning this up will increase saturation and compression. Like the name itself suggests, turning up this control will have this pedal plumbing the depths of the frequency spectrum. Turn it up to shake the earth. A familiar tone control that sweeps from treble cut to bass cut with a deep mid cut in the middle. The volume knob that doubles up as a clean/dirty blend knob if the DISGORGE switch is set to the right.